The same was true for my Thai in-laws when they visited us for a month in Austin. They weren’t craving healthy Thai food, they were craving the deep fried, heart-warming, guilty pleasure Thai food. So we made it, and it was so. so. good. But then we didn’t feel so good after about the third week. And once they were gone my Thai Hubby said he needed a detox, understandable! 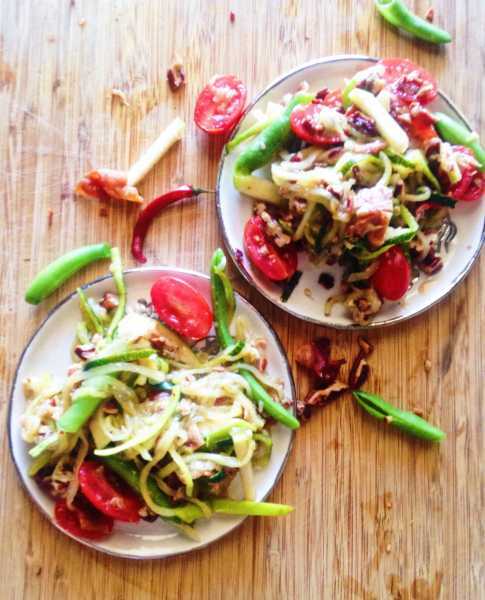 When I saw some zucchini noodles, zoodles, on sale at the store, I knew a Thai Zoodle recipe would be the perfect remedy for our bloated tummies. I had never ever cooked with zoodles before, but I had seen zoodle recipes sprouting up all over the food blogging world. 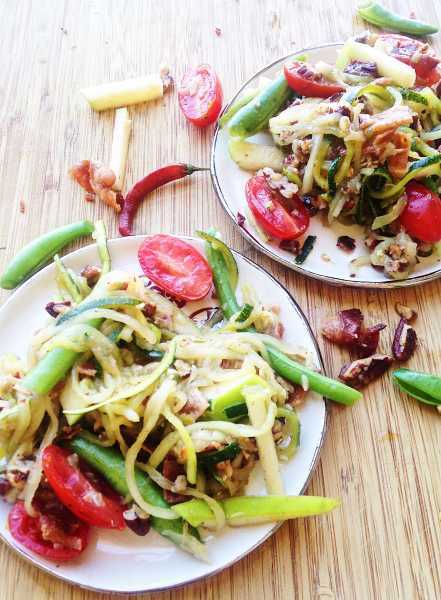 I tried to think of how to combine zoodles with Thai food and that’s how Som Tum Bacon Zoodle recipe was born. Som Tum is one of the most popular Thai dishes ever because it’s full of all the authentic Thai flavors: fish sauce, Thai chilies, garlic, lime, tamarind, dried tiny shrimp, unripe papaya, green beans, crushed peanuts and tomatoes. It’s pretty much a taste of Thai heaven in your mouth with every bite. And if Thais in America can’t find unripe papaya, sometimes they replace it with cucumber or carrots or something like that, so why not sub zoodles for papaya? Then my Thai Hubby and I went to a Thai restaurant in Austin called Sip Saam. One of their specials that day was Bacon Som Tum, and it was ammaaaazzing! Such a perfect fusion of crispy applewood bacon, granny smith apples, honey roasted pecans, and papaya. Bacon doesn’t really go with the idea of detox, but I only put a few small pieces in my Thai Hubby’s serving, so it worked! The flavors of this are the best ever. Please try this now and change your life forever! 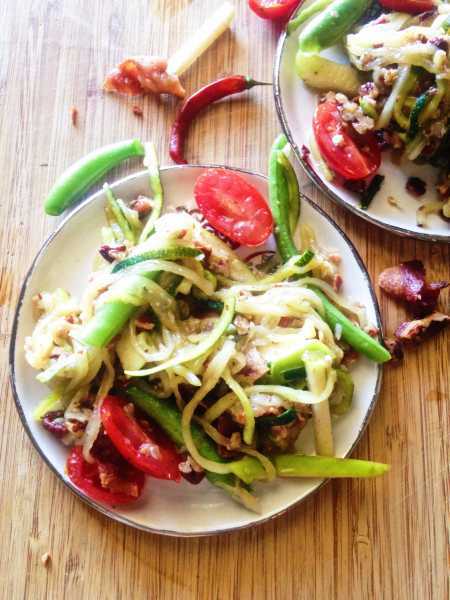 Enjoy your favorite Thai som tum flavors with a fusion twist using zoodles, bacon, honey roasted pecans and granny smith apple! So easy, full of flavor and fun! Make the bacon the method you enjoy most, pan, microwave or bake until it's crispy. Cut it into bite-sized pieces. Smash the garlic and chili in a mortar and pestle if you have one. If not, just smash it with the back of a chef's knife. 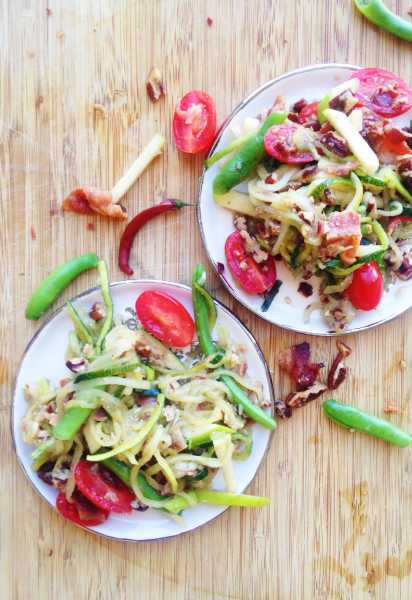 Mix all the veggies together along with the zoodles in a bowl, reserve the bacon and pecans for later. Whisk the Thai Bacon Som Tum Zoodle Sauce ingredients together in a small bowl. Add each ingredient a little at a time until it reaches the flavor profile you like. For this dish, I like it more sour and sweet, but make it however you enjoy, and don't forget the honey roasted pecans you sprinkle at the end will also add some sweetness to it. If you add too much of one ingredient, add a little water to balance the taste, and then add a little more of whatever flavor it's lacking. Once it's reached the flavor you like, sprinkle the bacon and pecans on top, and eat immediately. One time I made the mistake of adding the bacon and nuts too soon, and they got all soggy instead of crispy, so learn from my lesson, and don't add them until you are ready to serve it! 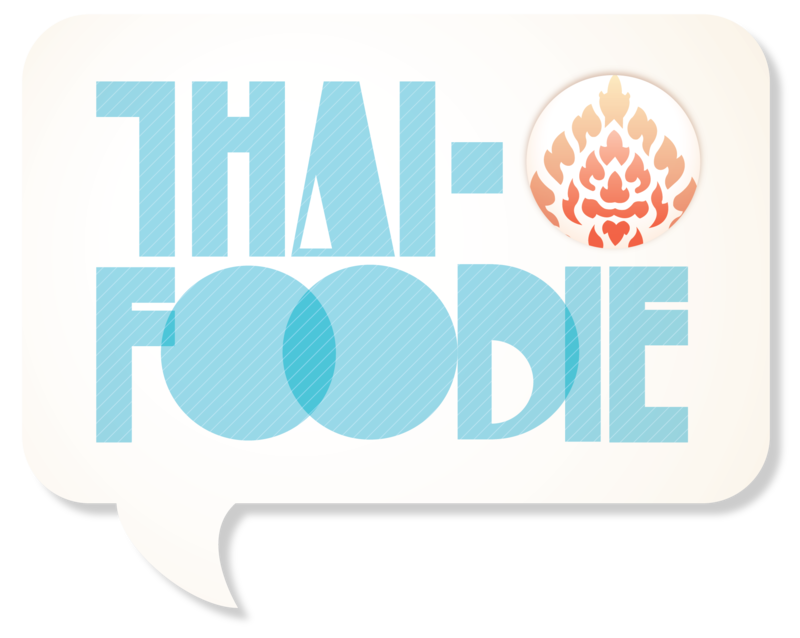 Enjoy alongside other Thai dishes you love, or eat on it's own for lunch!